The SQL AVG Function is one of the SQL Aggregate Function, which is used to calculate the Average of total records (or rows) selected by the SQL SELECT Statement. For example, If you want to find the Average price of a products present in your Store or you want to find the Average Cost of a Black color products present in your Store, you can simply use the SQL server Avg function. 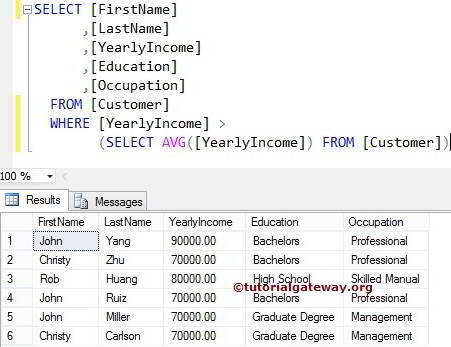 TIP: The SQL AVG Function will only work on Numeric Columns. The SQL server Avg function simply returns the Average of a total number of records present in the specified column. For example, The following query will calculate the Average of total records present in the [Yearly Income] column from Customers table. The Sql Server AVG (DISTINCT Column Name) simply calculate the average of the Unique number of records present in the table whose values are NOT NULL (Ignores the NULL Records). 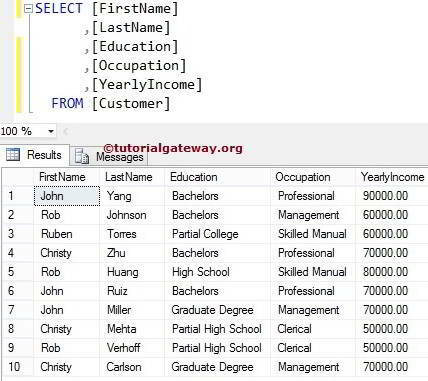 TIP: In SQL, DISTINCT Keyword is used to remove the Duplicates from the specified column Name. When we are retrieving the data, In some cases we usually check for the conditions against the aggregated data. In these situations we have to use Subquery in Where Clause. 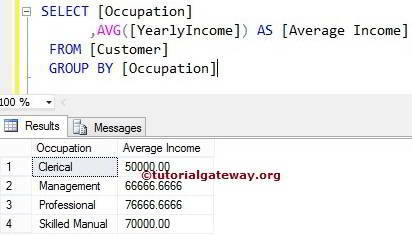 For example, The following Sql Server avg query will return all the Customers present in the customers table whose [Yearly Income] is greater than the average yearly income.